As China’s nouveau riche continues to develop a taste for yachting, tourism officials in Hainan hope the fledging industry will give the island province the edge when it comes to drawing wealthy tourists from home and abroad. "Yachting can strongly propel tourism and the local economy in a sustainable way," said Lu Zhiyuan, director of the Hainan tourism development commission, on Friday. Speaking on the sidelines of the provincial people’s congress, to which he is also a deputy, Lu explained that yachting could play a key role in the ongoing plans to build the island into a top international destination by 2020. China’s yacht market was worth about 3 billion yuan ($455 million) in 2009 and enjoys an annual growth rate of about 10 percent, according to one industry report. Official data also show more than 1,000 yachts are registered on the mainland. Some 37 percent of the most luxurious ones are docked at one of Hainan’s five yachting clubs (two in Haikou and three in Sanya). "Demand is high and rising quickly among rich Chinese," said Wang Dafu, chairman of the Shenzhen Visun Real Estate Group, and a deputy to the provincial people’s congress. 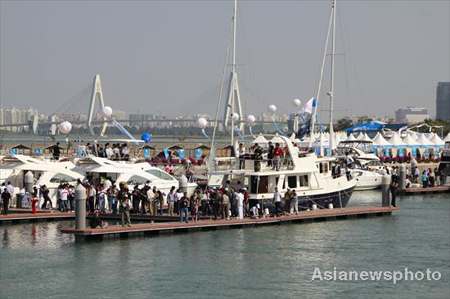 "Also, marine yachting fits into the high-end tourism market Hainan wants to tap." A Hainan native, the developer got involved with the yacht business in 2005, long before the State Council urged costal areas to foster the sport while developing tourism in 2009. "Government leaders then were wary of the luxurious and flamboyant image of yachting for fear of upsetting social harmony, particularly given the widening rich-poor gap across the country," Wang told China Daily. He said that changing attitudes in recent years, however, have helped the business to boom, especially in Hainan, which is blessed with the coastlines and climate needed to develop the sector. The province’s development plan for the next five years refers to yachting five times. Officials are keen to turn it into one of the pillars of local tourism, said Wang. "More importantly, developing yachting will benefit local people’s lives, although it’s unlikely to become a recreational activity that the general public can afford," he added. He estimated that a single yacht creates at least three jobs, as well as opportunities in related sectors like the hotel, catering and training industries.